Possibly the purest form of the genre: employing the wholecloth technique permits the practitioner access to creativity within areas of both traditional and contemporary textiles. The image thus created is, in either case, mainly or entirely, shaped by the stitches themselves. One can feel an intrinsic thrill at seeing the bas-relief forms rise slowly from the fabric as one works. 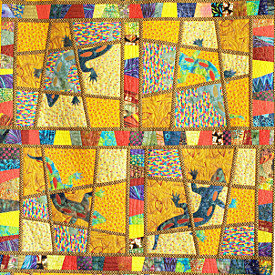 There would appear to be some confusion about the differences between contemporary and art quilts. 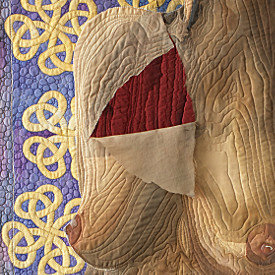 To me there is no confusion: I use the term to refer, within my own portfolio, to that work, usually pieced, which approaches a traditional idea or method within patchwork and quilting, from a new angle; adapting and moulding it to create something innovative. It does not need to be more sophisticated in its concept that this. Within this area of work I find much freedom of approach and a way to express myself. 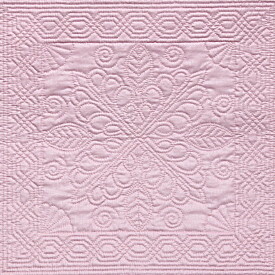 Although there is undoubtedly great pleasure in both wholecloth and contemporary textiles, I have discovered more depth of thought and consideration in the development of series of work and in using the mediun of textiles to convey a message which may be personal or a reflection of society. This approach is both more demanding and more liberating.